Add another shrimp to the barbie. The pressure over revelations of $8.35 million in debt piled up over the last four years unaccounted for in any Hoboken budget owed to water vendor Suez is mounting. Councilman Mike DeFusco made a call yesterday for a NJ Department of Community Affair investigation as reported on the Hudson County View. 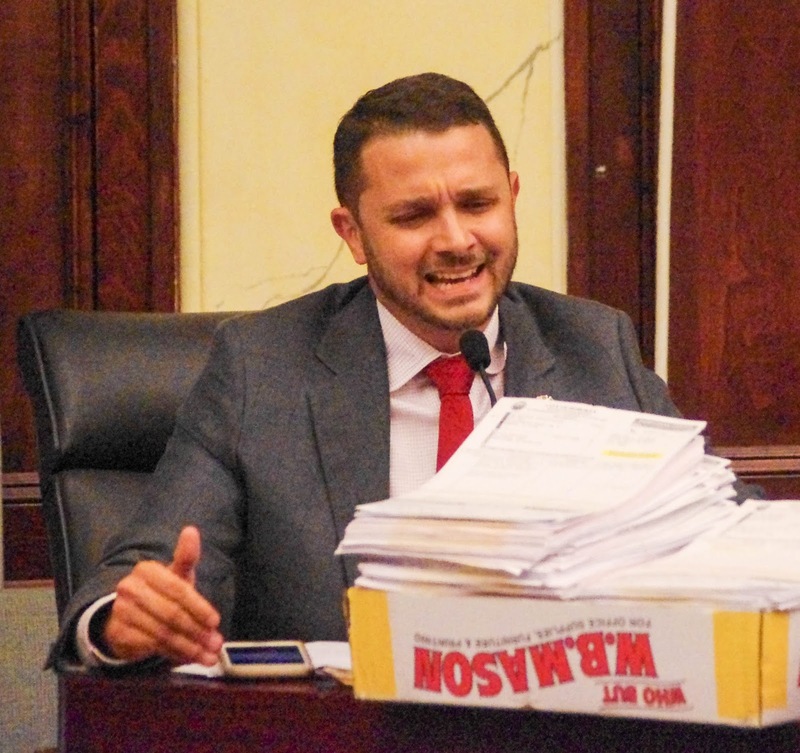 Then the first term councilman running for mayor turned his attack on his mayoral opponent City Council President Jen Giattino who with council members Tiffanie Fisher and Peter Cunningham uncovered the unaccounted millions in red ink. His campaign released a statement in part writing, "This unbadged, previously unknown liability is a shocking display of either incompetence or obfuscation by the Zimmer administration and its Council allies Ravi Bhalla, who is a member of the Subcommittee on Infrastructure and Council President Jen Giattino, who is also a member of that committee." Then the DeFusco campaign release turned to a potential tax increase. "It's difficult to believe that a publicly traded company would allow a liability so large over several years and not say anything to the debtor. This could amount to a 15% tax increase to pay off this unfunded liability, which would be a harmful outcome for our city." At the Wednesday meeting, Councilwoman Tiffanie Fisher inquired how a substantial cost owed to Suez didn't follow with anyone in the Zimmer administration calling the water vendor to the City for the actual number owed. Fisher detailed efforts to obtain financial analysis from the administration, specificity on the $8.35 million liability and proposed contract but was like other members of the infrastructure subcommittee rebuffed. Other members of the subcommittee include Jen Giattino, Peter Cunningham and Michael Russo. Mayor Dawn Zimmer spoke at the council meeting asking for passage of her proposed new water contract with Suez but did not take any questions. The mayor has not made any public comment when she learned of the $8.35 million liability to Suez. Various consultants and members of the administration commented at the meeting on when they learned about the million dollar liability. Their answers ranged from earlier this week, two months and a year. The mayor says her proposed contract with Suez provides $40 million in benefits and erases the $8.35 million owed the water vendor. The council did not vote on the contract as no one would sign on as a sponsor. Other council members previously questioned why a contract of such magnitude to the City was not put out for competitive bidding. Councilman Dave Mello publicly asked the question at the August council meeting. Some on and off the council believe the lack of a bidding process was to allow Mayor Zimmer to erase the four year incurred liability without disclosing the red ink to the City Council and Hoboken public. They question how Hoboken could extract the best water contract when Suez held the liability as leverage in exclusive negotiations. The original Suez contract with the City of Hoboken was signed back in 1993. Jen Giattino, Tiffanie Fisher and Peter Cunningham. Talking Ed Note: Mike DeFusco is making some hay with the yet unexplained millions accumulating in red ink owed to Suez. He's brought out a tommy gun and is spraying the administration and turning it on his colleagues who blew the whistle. There must be an election going on or something.